Mega Man 3's password system may look pretty complicated, but it's actually pretty easy to figure out. For example, it uses the placement of a single red dot to record how many Energy Tanks you have, and you can totally use this to your advantage. For example, take this code that I got for having beaten no Robot Masters and having no Energy Tanks. To start the game with 9 Energy Tanks, the maximum! From there, it's a simple matter of recording your password, moving the dot, and continuing on each time you need a refill! 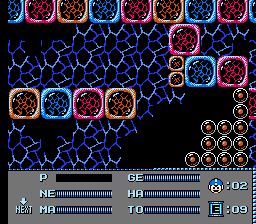 If you remember a while back, I told you about a way to vastly increase Mega Man's jump in Mega Man 3. It turns out, though, that there's more to that trick than first it seems. First, grab controller 2, and hold down the Right arrow, just like before. You might want to recruit a friend or a rubber band to do the honors, since it's hard to do on your own. After that, find a conveniently-placed hole, and jump in. It'll need to be a hole where an enemy will follow you. 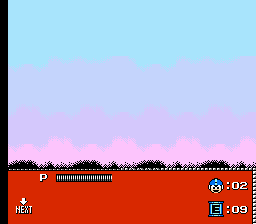 Let the enemies hit you while you're offscreen and eventually, you'll run out of life points and hear the "you dead" sound. But, as long as you're holding down the Right arrow, you can still jump out and walk around, even with no life points. The awesome thing is, that now enemies can't kill you off. They can hit you all they want, but you'll never explode. 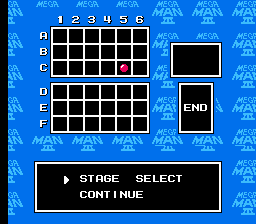 The downside is, though, that your Mega Buster doesn't work any more, since Mega Man's energy for that weapon is gone. The rest of his weapons work fine, though. And since the Rush Marine is all but useless, I like to use that to fire the Mega Buster. Just don't pick up any health powerups. If you do that, you will be able to die again if you get hit. Oh, and spikes are still lethal. They're jerks that way. This is pretty inconvenient since the boss robots, and most of the other robots in the game for that matter, are far more maneuverable than you are and can jump to nearly the top of the screen. Wouldn't it be awesome if you could do the same? Well, hang on to your headwear. 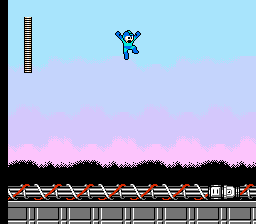 If you plug in a second controller and have someone hold down Right on the control pad, suddenly Mega Man can jump much higher. How high? This high! Even better is that if you fall into a pit, as long as the Right arrow is being held you can just jump back out. Just a note, I couldn't get this to work in the Mega Man Anniversary Collection version of the game. It's old-school NES version only, I'm afraid. 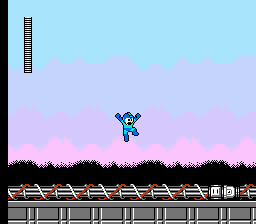 There's a whole lot to his angsty story in the Mega Man universe, but I'm really not going to go into that here. 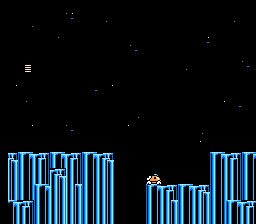 In Mega Man 3 he just kind of appears every once in a while to fight you in a dead end for a few minutes and then he opens up a path for you to proceed. And his arrival is preceded by five very distinctive notes on a whistle. But, if you've ever finished the game, you might know that there's more to the little ditty he plays. And, you can hear those extra notes pretty well any time you want, with a little timing. 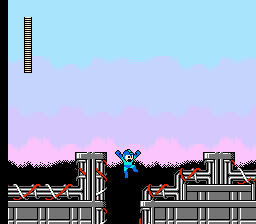 So first, go to a stage where Proto Man appears, like Gemini Man's stage above. 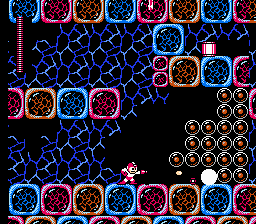 Then, once you get to the screen that Proto Man appears on, but before his song starts, hit the Pause button. Done right (and you have an extremely small window of time to do it) the song will keep playing for a bit. Once it's done, unpause the game and then continue normally. And, this does work for both the original NES version and the Gamecube Mega Man Collection. And, no, this isn't all that useful, really. But it is kind of neat, especially if you're a huge Proto Man fan... Those exist, right?